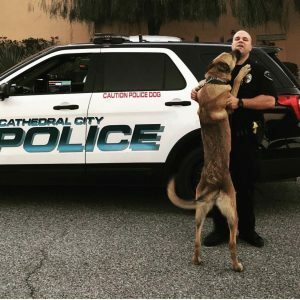 The Cathedral City Police Department started its K-9 unit in 1986. Since the program started 11 German Shepherds have been “employed” by Cathedral City, and now we have our second Belgian Malinois. The Police Department has been authorized two positions for Police K-9 handler. Officer Jeffrey Bird has been a police officer for 12 years. 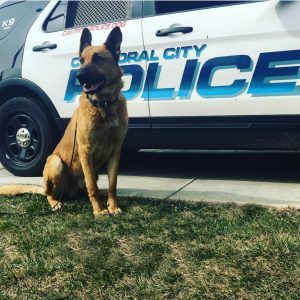 He became a K-9 handler in April 2016 with his new K-9 partner, Robi. K-9 Robi is a Belgian Malinois who was born in Holland on September 8, 2015. K-9 Robi’s training began as a puppy while still living in Holland and hence, his commands are given in Dutch. K-9 Robi is a dual-purpose K-9 who is trained in the detection of narcotics (Heroin, Methamphetamine, Marijuana and Cocaine) and Patrol work (tracking, area search, suspect apprehension, handler protection). Officer Bird and K-9 Robi are trained by Vohne Liche Kennels located in Banning, CA. The purpose of utilizing a police K-9 enables police to locate suspects in a more efficient manner. The K-9 can alert on a concealed suspect much more quickly than a human being, giving both the K-9 and the officer time to react. Along with tracking suspects K-9’s are used for detecting narcotics and explosives. The K-9 can also chase after a running suspect and capture him/her much more quickly than an officer can. The use of K-9s also reduces the amount of injuries received by Officers who might have to physically fight with suspects. Many times a suspect will surrender without a fight just from the presence of a police dog. K-9 officers take commands from the police officer in different languages such as German, Dutch or Czech. People always wonder who cares for the K-9 and where does it live? The police officer takes the K-9 home and cares for the K-9 at his/her own residence.